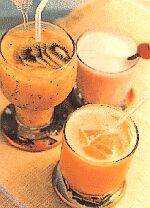 In a blender or food processor, place orange, grapefruit and half portion of the kiwi fruit; process until smooth. Add sugar and Sprite and mix thoroughly. Pour into a well-chilled container and freeze until ice crystals begin to form. Blend again until smooth. Return mixture to the freezer and freeze again until completely set. Scoop slushie into individual serving glasses and serve, topped with chilled kiwi fruit slices.